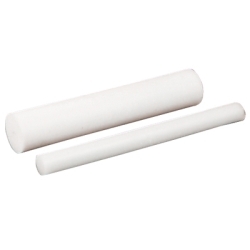 1" Polypropylene Rod | U.S. Plastic Corp. This rigid, translucent white-tan polypropylene (PP) rod has excellent corrosion resistance to a wide range of chemicals and can be cut with a wood saw and drilled with regular metal bits. It also has fair impact resistance and very good abrasion resistance.